But I have an idea that is specific. Dogs with backpacks don't chase skeletons. Can be changed in the config. 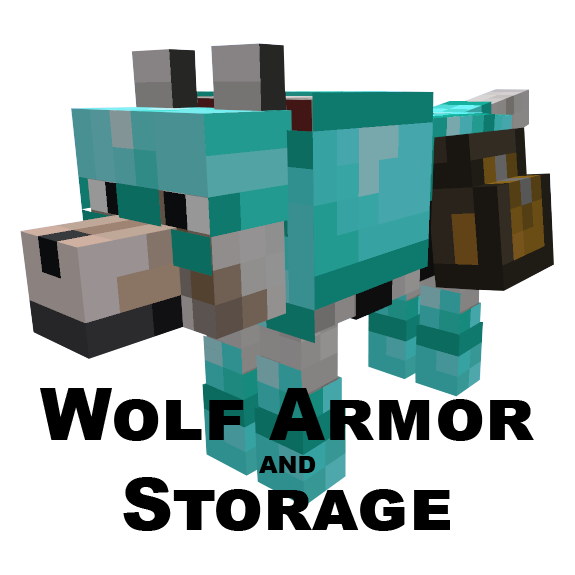 May i use this for my modpack? 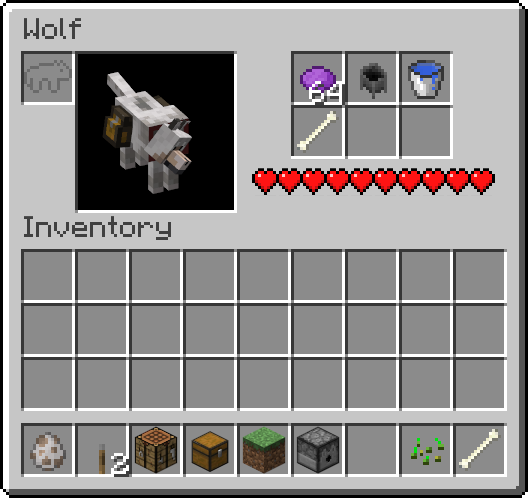 How does one Dye the leather wolf armor? I can't seem to get it right! Awesome mod, I can't wait to see the future updates, especially the Command / Training Tab and the whistle. This is the best wolves related mod yet. Its simple, and keeps to the vanilla feel. 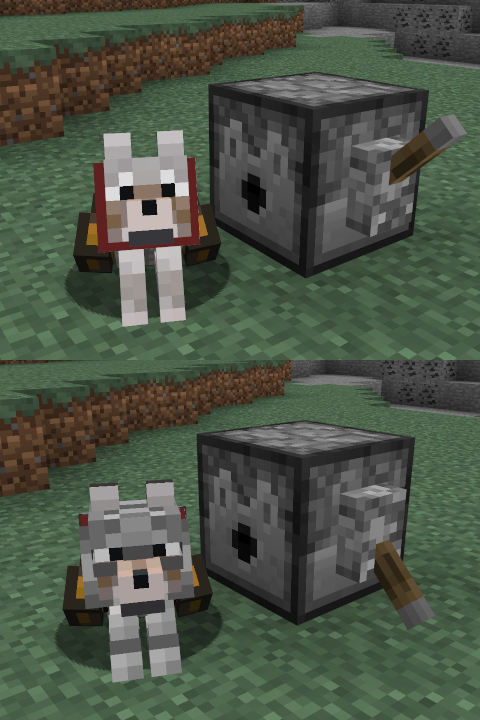 The mentioned possibility of the future use of ender chests would make this a truly indispensable mod. 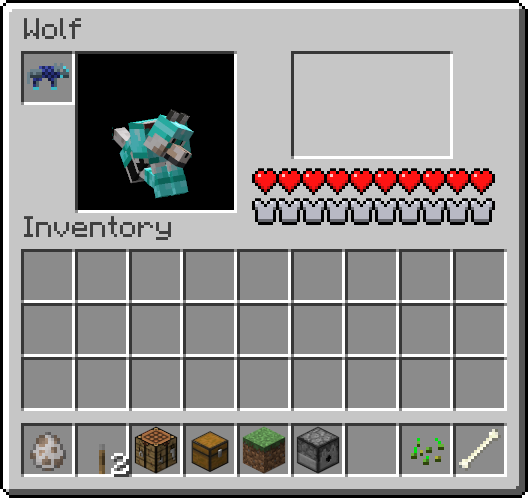 When you right click it brings up the inventory, but maybe there could be a side tab or an arrow for changing pages and the other pages would have features like toggling the skeleton chasing and attack/defense mode. AI could be customized in-game. The previously mentioned aggression stats and what not could be shown with numbers or meters the way it is with the armor. Looking forward to that awesome 1.4 update! When I wash the leather armor in a cauldron, the color goes away, but it doesn't make the sound normal leather armor makes. Also, you can continue to "wash" un-dyed armor, using up water (this cannot be done with normal leather armor). Added that to the issue tracker, thanks. I'll get that in 1.4 (the next version for release). This looks really well done, I can't wait to try it out. Now I'll have an excuse to take my wolves with me ;). 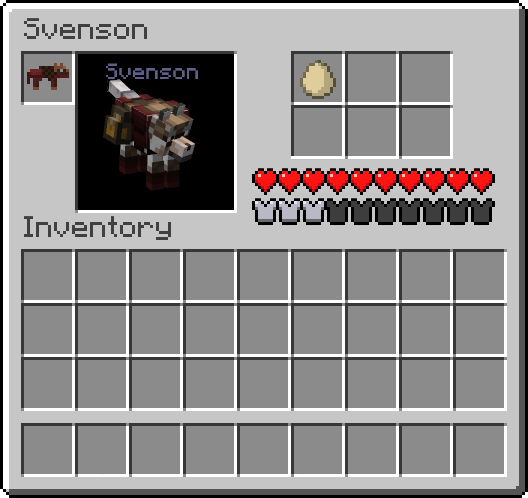 Is the leather armor dyeable? If not, it should be. Review of modifications in Russian - https://www.youtube.com/watch?v=hE-AoFNWthQ.